After removal of a foreign body, the wound should be irrigated thoroughly. A puncture wound is difficult to clean adequately because either the small wound diameter prevents the irrigation fluid from reaching the wounded tissue or the fluid enters the wound but does not completely drain. If the puncture is contaminated, the entrance wound can be enlarged to allow more effective cleaning. If foreign debris is impregnated in tissue, the contaminated area can be debrided or excised. If multiple radiopaque objects were removed, a postprocedure plain film should be obtained. The decision to close lacerations, incisions, and block excisions depends on the potential for infection; wounds where all foreign contaminants can be removed and those in locations with good blood supply can be closed primarily. Otherwise, delayed primary closure is preferred to immediate closure. Necessary tetanus immunization (TIG and/or Td) should be provided. 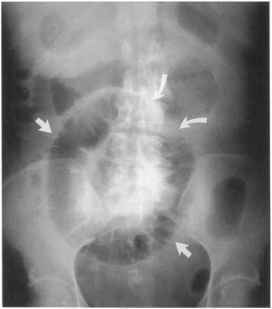 If a foreign body is deliberately left in place, the patient should be informed. If foreign material was removed, the patient should be warned that there is always a possibility that not all pieces were found.